HOUSTON, Texas – The Texas Access to Justice Commission honored Gwendolyn Dawson with its Corporate Counsel Pro Bono Award last week during the Business Law and Corporate Counsel CLE and Luncheon, which was held in conjunction with the State Bar of Texas’ Annual Meeting. The Corporate Counsel Pro Bono Award recognizes an outstanding corporate counsel attorney who actively provides pro bono services to low-income Texans and promotes a pro bono culture within the corporate framework. The award is accompanied by a $2,000 stipend to be designated to a legal aid organization of the award recipient’s choice. Ms. Dawson currently works as a legal manager in the Law Department of Exxon Mobil Corporation and has dedicated more than a decade to the corporation. Upon earning her J.D. from the University of Texas School of Law, Ms. Dawson clerked for Judge Dineen King at the U.S. Court of Appeals for the Fifth Circuit, and later worked for Vinson & Elkins LLP and King & Spalding LLP. She applies her various work experiences to providing legal counsel to low-income Texans through TexasLawHelp’s “Live Chat” Program, which is administered by the Texas Legal Services Center. Ms. Dawson began volunteering in August 2017 and has handled nearly 150 chats, with a 90 percent satisfaction rating from chat users. Beneficiaries of her legal help explain she provides practical, thorough, and informed help in a sensitive and compassionate manner. Ms. Dawson is actively engaged in other ExxonMobil sponsored pro bono activities, including volunteering at the Refugee and Asylum clinic, co-sponsored by ExxonMobil and Norton Rose Fulbright and Catholic Charities, and the Houston Volunteer Lawyer Veteran and Pro Se Divorce Clinics, co-sponsored by the Houston Bar Association and Houston Volunteer Lawyer. She has been recognized by ExxonMobil’s pro bono program as a “Prized Treasure” for her compassion and commitment to helping those in need. She gives of herself and shines as an outstanding example for pro bono service in the corporate setting. 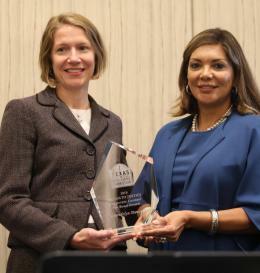 The award was presented to Ms. Dawson by Texas Supreme Court Justice Eva Guzman, the Court’s liaison to the Texas Access to Justice Commission. Texas Legal Services Center was Ms. Dawson’s designated recipient of the $2,000 stipend.